The Turquoise Ledge: A Memoir, Leslie Marmon Silko. Viking: the Penguin Group: New York, 2010, p.45. “An Indian needs to speak with God, and so, obedient to his Christian training, he travels to the Vatican, where the Pope has a red phone, a hot line to God. But the Indian can’t talk at length because it’s a long distance call. The next time the Indian needs to speak with God, he remembers his disappointment and decides to drop by the tribal medicine man’s house. Turns out the medicine man has a hotline to God. On that phone, however, the Indian can talk as long as he wants because it is a local call.” Hunger for the Wild, Michael Johnson, p. 18. The searing rays of summer sun drove us into sheltering shadows of St. Jerome Chapel. My wife Janice held one-year old Erik in her arms as his eight-year old sister Katie drew close. We leaned against the cool adobe walls and sighed with relief. June 24, 1984. We were spiritual tourists at the Taos Pueblo, high in the mountains of northern New Mexico. The San Juan Day Corn Dance was supposed to begin at 5pm, but seemed to be running late. I asked one of the reservation security persons when the dance would begin. “Hard to say,” he replied. “We are on Indian time here.” Another tourist nearby chuckled, as if this indicated a liaise faire attitude about time for these people. I thought otherwise: sacred time is when it is the right time. I gazed across the pueblo plaza to two clusters of multistoried adobe pueblos, long wooden ladders leading to each higher level. A stream filled with clear, bubbling water flowed between the two buildings. The water came from the sacred Blue Lake high in the mountains to the northeast. One-hundred-fifty Tiwa Indians live in this thousand-year-old settlement, choosing a traditional lifestyle without electricity or running water. An ancient man clad in red robe climbs a wooden ladder to the roof of the third level of the pueblo. His voice crackles and rises in volume and intensity. Whom is he shouting at? He thrusts both arms upwards toward the sun, continuing his shouting in rhythmic cadence. A large drum, six feet in diameter, appears at the corner of a dwelling, surrounded by five men beating a hypnotic rhythm. A cloud of dust moves toward them, two rows of dancers emerging. One row consists of young women shaking maracas, holding ears of corn, cornhusks hanging from their waste bands. The other row is young, bare chested men, some with eagle feathers in their hair. Each line of dancers moves together with measured hops, the drum beats faster. I watch the performance, wondering if this interaction of corn and young men and women connects somehow to the fertility of the corn crop. Behind me, another tourist begins a narrative to his group, explaining what he sees. “See that dancer wearing the red sash. This is an authentic corn dance…..” I try to listen to glean information, and then something catches me and pulls me back. There is visceral tightening of my stomach in resistance. I look back at the dancers and sigh as I see their faces. This is prayer, not a performance. These people are praying! Now I thought about the time of Holy Communion in my church. The priest walks down the communion rail, holding up the host, saying, “Body of Christ. Bread of Heaven.” Placing it within an open hand. I imagined that same irritating guy somewhere in the shadows, saying, “See that priest over there. This is an authentic mass. Let me explain it to you.” No, this is not a tour or a performance. I am watching people praying and I begin to pray with them. Over the last two hundred years, the pueblo Indians have become more and more secretive about their rituals. American and European anthropologists have camped out on the reservations, seduced Indians with gifts, developed friendships, and secrets were disclosed. These tribal mysteries appeared in print and made a name for the scholar. 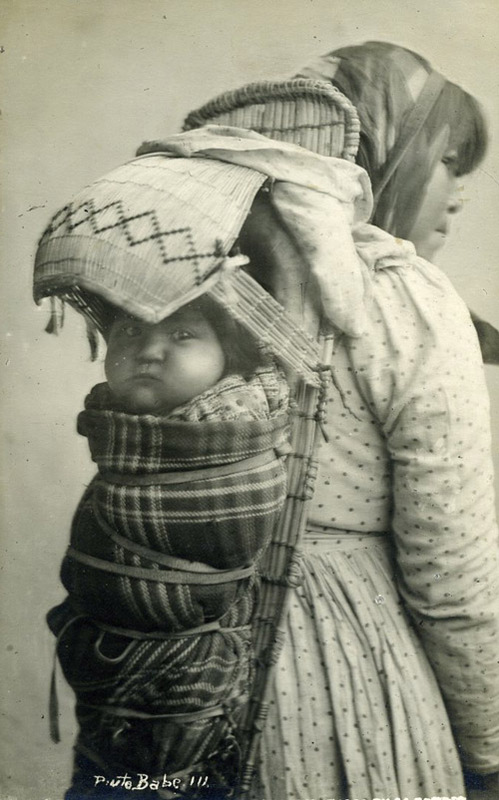 As a result, the pueblo people do not even share ritual information with a spouse, if they are of a different clan. 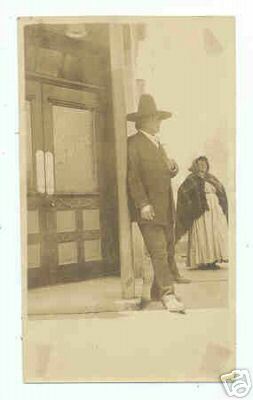 Swiss psychoanalyst Carl Jung visited the Taos Pueblo in the 1930s, in his exploration of myth and ritual among world cultures. One day he is up on the same roof as that ancient man I saw in the red robe. This time he is speaking with the pueblo chief Ochwiay Biano. The sun hovers over them on a hot summer day. (p 252, Memories, Dreams, Reflections, by C.G. Jung, Vintage Books (Random House): New York, 1963). Are we spiritually homeless, as Jung suggests? What is the attraction of Native American spirituality to you? As you read about the sense of coexistence between humans and the natural world, and homey encounters with earth creatures, is there a yearning beyond words the stirs within you? As inheritors of European philosophy, we live in a culture that is suspicious of mystery and enchantment. A definition of religion is “that which connects all of life together.” There was a time in history, when Paris, France for example, lived this definition holistically. Religion connected all of life together in the year 1500. The courts, social service resources, education, hospitals and medical care were all sustained by the Roman Catholic Church. If you were Jewish or Muslim, you were not included in the circle of life. Charles Taylor, in his book A Secular Age, contrasts the year 1500 and our present age effectively. In 1500, it was assumed that everyone believed in God. That natural world of storms, plagues and floods were seen as divine activity. Daily life was interconnected with religious ritual and people lived in a world of spiritual enchantment. In the precarious conflict between darkness and light, faithful believers were in a secure place. This enchanted world of medieval Europe was very similar to the kind of world we encounter today with practitioners of traditional indigenous religions, such as the Owens Valley Paiute. The world was filled with spiritual forces to be reckoned with. There was holy help from the saints and spiritual objects such as the Host wafer of the mass, holy water, oil and candles. There was spiritual help out there to protect us. However, if we were not careful, that power could possess us in terrible ways, like sickness. In this enchanted world of Paris in 1500, I needed to win over these spiritual entities. There were holy places like wells, rivers, and mountaintops that could give spiritual protection. In this world, the Bible in Latin was the literal word of God interpreted by the Church. In 150 years, this perspective radically changed. Early scientists like Galileo and Francis Bacon demanded that we use our human reason inductively by studying the Book of Nature. Rene Descartes (1506-1650) is the philosopher we most identify as directing the shift from the old religious orthodoxy, where everyone was assumed to believe in God, to a new world, launching the modern age and the primacy of the individual. Descartes craved certainty. He began by putting aside all dogmatic assumptions about truth and turned to what we can really know. One night sitting in front of a fireplace, in deep contemplation, what came to him was the one thing of which he could be certain: Cogito ergo sum. I am thinking right here in this rocking chair in front of this fireplace, and therefore I do exist. Descartes separated mind from the body. The task of the mind is to control the body and its passions. The body is a machine that can be studied by the mind. Traditional belief was that sickness had a spiritual cause. But if we could study the body thoroughly we could find ways to heal sickness. “This super buffered self…is not only not ‘got at’ by demons and spirits; he is also utterly unmoved by the aura of desire. In a mechanistic universe, and in a field of functionally understood passion, there is no more room for such an aura. There is nothing it could correspond to. It is just a disturbing, supercharged feeling, which somehow grips us until we can come to our senses, and take on our full, buffered identity.” The Secular Age, P. 136. Religion in Europe shifts from assumed affiliation to a personal decision one makes in one’s life. Spiritual experiences of enchantment within nature are shunted off into an isolated corner. Real knowledge and progress can only come through the application of human reason. What does it mean for you and me to live in this secular age? We have moved from a world that assumed that you belonged to a common belief in the Holy One, a world of religious enchantment. We live in a very different world. Another influence of this loss of our religious naiveté was the Protestant Reformation. Max Weber writes in the Protestant Ethic and the Rise of Capitalism (1905) that by denying the sacramental and dismissing all magic and enchantment as of the Devil, by connecting the work ethic to commercialism, the Protestant Reformation opened the way for antireligious humanism. A third movement of this disenchantment of the West has occurred in America. At one time, the colonies each had a State church. For example, in the Colony of Virginia, it was assumed that you were an Anglican. With the efforts of Jefferson and Madison applying the new teachings of this Age of Reason, the American Constitution endorsed the radical, new idea that every person should be free to choose their own spiritual path. I am not compelled to give allegiance to any religion in which I do not believe. Robert Bellah, in his classic study of American life in Habits of the Heart, charts the progress of religion in America. We have moved from established state churches in the colonies to which we had to belong, to a privatized spirituality. In American culture, religion is a private matter. However, something has been happening in our country that suggests the contrary. Since the late 1960s, our country has been experiencing a new Great Awakening. The influx of immigrants from Asian introduced Buddhism, Taoism and Hinduism. A hunger for personal religious experiences was being fostered. At the heart of this new spiritual searching was engagement with Native American Spirituality. There is an antidote in Native American Spirituality for the cold, rational, buffered Self of the secular age. As you walk with me in the Owens Valley, you enter a land in which, for more than 10,000 years, traditional religion has lived a relationship to the visible creation and the world of spirit. Humans share kinship with all creatures of the natural world and with the world of the spirit. Because creation is in a constant state of flux and deconstruction, rituals and ceremonies work at harmony and balance. Creatures of nature such as the fox, coyote, snake and hawk can be intermediaries of communication between humans and the spirit world. Men and women who have been touched in a special way by the spirits become shamans, powerful healers, who are able to penetrate the thin places between humans and the spirit world. Powers and visions can be experienced directly. There is a common view of the cycle of life and death and of cosmic harmony. This is a numinous world in which all activity is spiritual. As you drive north past the intersection of Highways 14 and 395, the road hugs the western shoulder of a vast ancient lake bed that is today the Indian Wells Valley. In the distance, you see a narrow notch between the Sierra and Argus ranges. Through this gap flowed thawed glacier waters, which spilled around you, and eastward filling lake basins of the Panamint and Death valleys. As the road climbs up to pass through the distant gap, high cliffs of volcanic reefs seems to move toward you from the east. Suddenly the green-blue waters of Little Lake appear on your right, the land flattens, and a huge red hill thrust into view. You have entered the land of the Numa People, the Owens Valley Paiute. Six tribes have historic claim to this valley: Panamint, Lone Pine, Independence, Big Pine, Bishop and Benton are now the reservations. Driving north on 395 you pass through quite desert towns with a distinctive sign of the local tribe posted at each town limit. 150 years ago, this was their land. For ten thousand years family clusters lived in the verdant land of dashing deer, gushing blue waters, and clouds of wild fowl. This primal Eden suddenly changed with the incursions of explorers and mountain men, discovery of gold and silver in the Inyo Mountains, and the settlement of towns and herds of cattle and sheep to sustain the invasion of the Euro Americans. As the native peoples frantically defended their villages and food sources, conflict intensified. The US Calvary base at Fort Independence rounded up the tribes marching them as a “trail of tears” southward to Fort Tehachapi. Many died in that forced march, others escaped. 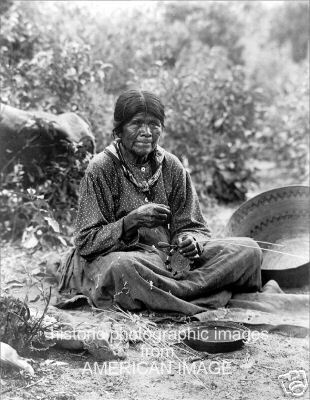 Eventually accommodations were made and native people found work as washerwomen, house servants, farm workers and cowboys. 150 years later Paiute life has shifted back into self-determination. Income from the popular Paiute Casino in Bishop and shared income from other casinos have resulted in new homes, jobs, community health clinics, early childhood education centers and progressive programs for family violence prevention and addiction recovery. New generations of Paiutes are returning to the reservation as teachers, attorneys, community organizers. But the spiritual connection to the land and their traditional religion continues. From Lone Pine, California, traveling about fifteen minutes north on Highway 395, we come to the town of Independence. Look for the Post Office on the left. Turn west on Market Street, heading toward the Sierra Nevada. This would eventually bring you to Onion Valley, the base camp to hike up over Kearsarge Pass. However, in a few blocks, you will turn right at Grant Street, leading you to the Eastern California Museum. As you drive into the parking lot, you will encounter an outdoor display of mining and farm equipment going back 130 years. Within that area are also buildings transported from local ghost towns. The Museum itself has an extensive bookstore. 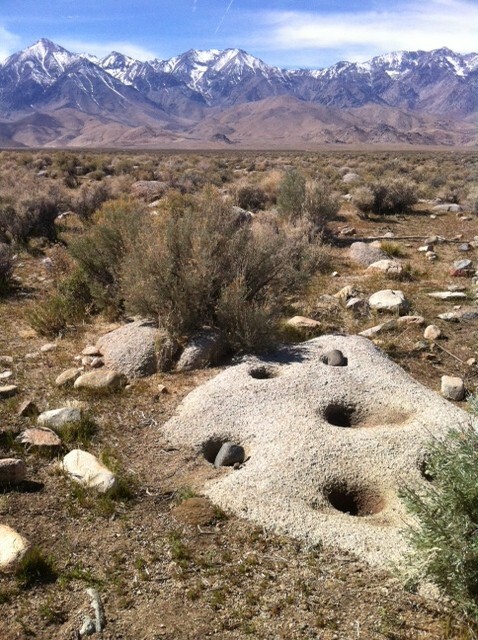 This place is a hidden gem and will help you get a feel for the complex, multicultural history of the Owens Valley. Displays tell the stories of the Manzanar World War II Japanese American Relocation Camp, mining and farming. A rare collection of Native American basketwork is located in a separate wing of the museum. You will want to return to this Native American section after the walk I will describe. Leaving the Museum building and walking north, we come to the Mary DeDecker Native Plant Garden and Nature Trail. In 2001, volunteers from the Bristlecone Chapter of the California Native Plant Society planted forty-three species representing eighteen plant families, including saltbrush, desert olive, water birch and western hackberry. The garden includes several well-placed benches, inviting contemplation. I sit on one bench as I bask in the spring sunshine. Water from Independence Creek flows around me and the desert landscape spills westward, leading to the snow-blanketed Sierra Nevada. As the sun warms me, prickly shivers cover my body with gratitude to God for this creation. It is hard to slow down our busy minds, even when we are out here in nature, exploring, photographing, evaluating, studying, writing about what we see and what we think about all of this. As I sit on this bench, surrounded by astounding beauty, God is very close. My mind is still. Thoughts come and go. I breathe. I am grateful. I walk the serpentine trail on a sunny March morning, pungent perfume of sagebrush (artesmisia tridentate) fills the air. Two railroad-tie bridges take me over Independence Creek. Soft wind blows down from Kearsarge Pass, music of water washing over rocks and birds singing. I continue on the trail through an opening in a barbed wire fence. The distinctive, rock lined trail guides me through vast landscape. Suddenly I am captivated by a surprising sight. All around me are the tiniest of spring flowers in full bloom. Last week six inches of snow covered the ground. 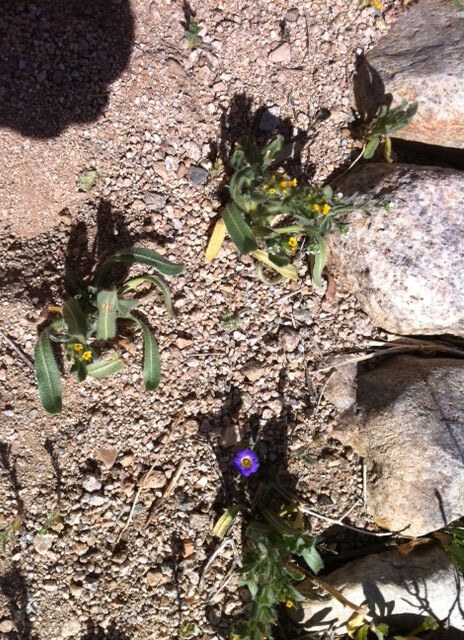 Today delicate, miniature yellow, blue and red flowers line the trail. Another surprise: a shallow, flat rock covered with five grinding holes. 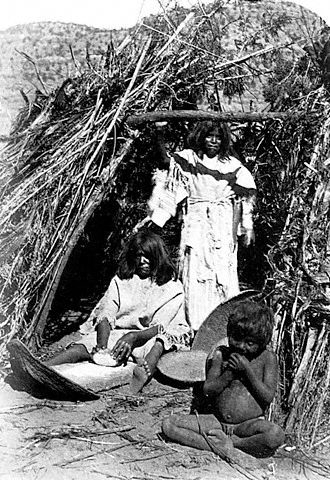 Here was a place where Paiute/Numa women prepared food. 70% of their food came from vegetation like lovegrass, blue dicks, tomcat clover, yellow nut-grass and Indian mountain grass. The migratory movements of the extended family clusters continuously searched for food from the land. I continue on the rock line trail heading toward another branch of Independence Creek. As I come to the place where the trail begins a turn to circle back toward the museum, another surprise. More grinding stones. Usually this is a rare sight in my desert hikes, but at this place, there are dozens of rocks with grinding holes. A substantial village must have been located here, with domed toni nobe circular shelters made from willow and tule reeds. Willow branches created a frame, which was covered with tule bundles. A single door faced to the east. I can see some circles of stone, which might have been foundations for toni nobe. Standing within the remains of this village, I see the grinding holes and mortal pestles still in place. I imagine the rhythmic sound of grinding, the chatter of mothers, daughters and grandmothers together. There is singing. This is their home. This is their sanctuary. Neither Wolf, Neither Dog: On Forgotten Roads with an Indian Elder, by Ken Nerburn (New World Library, 2002). A disturbing and honest encounter with oppression of Native culture in the past and hope for the future. This entry was posted in Blog and tagged American Indian, Carl Jung, Descartes, desert spirituality, Enlightenment Philosophy, Max Weber, Meditation Walk, Native American, Owens Valley, Paiute. Bookmark the permalink.